One of my passions is connecting with individuals and audiences of all sizes during trainings and other educational events. I have provided a variety of training sessions to schools, districts, and large conference audiences including School Nutrition Association’s Annual National Conference (SNA ANC), American Commodity Distribution Association (ACDA), and many. If you have an idea for a training, marketing campaign, or any other program or initiative you’d like to create, hesitate no longer. As a Chef and Registered Dietitian, I believe we can work together to craft tools and frameworks that will elevate your child nutrition program. The possibilities are endless! Creating a culinary culture in your child nutrition kitchen can elevate the organization — so it becomes a vibrant environment that passionately provides healthy meals to kids. In the first part of this session, participants will be challenged to think about their own professional and interpersonal skills, goals, and purpose related to their daily culinary tasks. Each participant will be invigorated as they are helped to see their position as a career, not just a job. During the second half of this session, participants will collaborate as they learn culinary terms and skills that pertain to child nutrition meal preparation and service. Let's create a professional culinary culture in your kitchen together! Understanding culinary techniques is a critical element of preparing flavorful food for children. This culinary workshop will provide your staff with hands-on skills that focus on safe and efficient techniques using the kitchen’s most essential tool: the chef’s knife. Participants will learn fundamental cuts required for preparing fresh fruits, vegetables, and herbs — all while exploring how to enhance flavors, textures, and the appearance of school meals. Students will come away with the knowledge and skills that will elevate the culinary culture in your kitchens. Expect to stand for the duration of the class. Wear comfortable, closed-toe shoes and have long hair tied back. 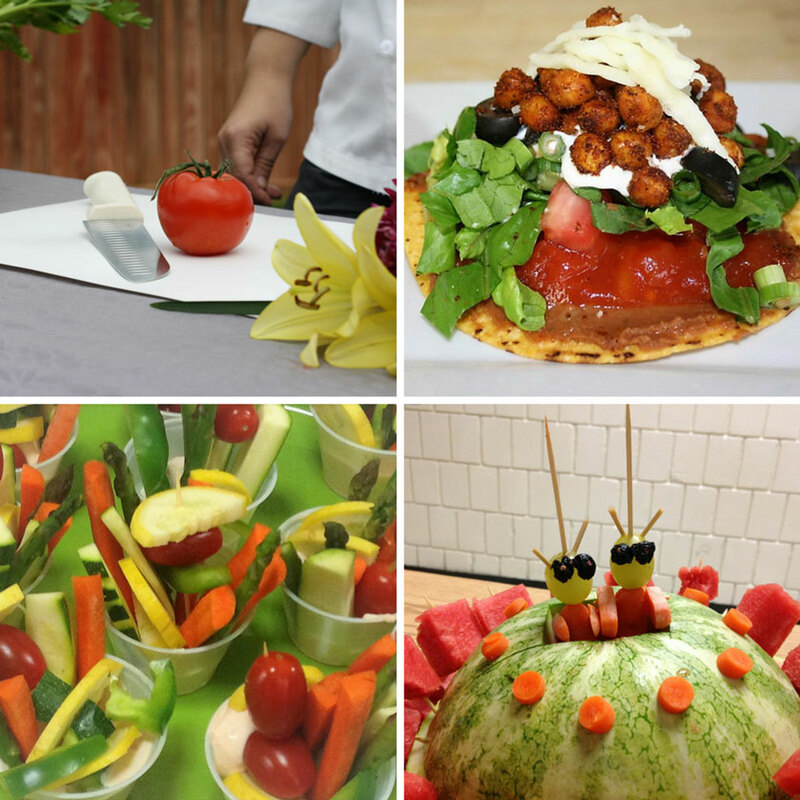 Garnishing your service area is a fun way to draw students to your cafeteria and encourage them to eat fruits and vegetables. Plus, it gives employees an opportunity to display their creativity and culinary skills. In this session, CN professionals will learn the basic principles of marketing and creative food design. They will gain hands-on experience using a variety of creative culinary tools to make fun and easy art pieces. After completing this course, attendees will be eager to take what they have learned and become creative marketing agents in their cafeterias. Participants should expect to stand for most of class. Expect to stand for the duration of the class. Wear comfortable, closed-toe shoes and have long hair tied back. Open your culinary senses and bring out your creative side by exploring the world of herbs, spices, and seasonings. In this hands-on cooking class, participants will learn herb and spice preparation techniques that will elevate the flavors in their child nutrition program. In addition, they will create seasoning blends that they can take back to their kitchens to cook with or for setting up flavor stations in their serving areas. Are you looking to amplify a special occasion at your school or district? Let’s do it! This is a great time to highlight all the wonderful things you are doing in your kitchens. Many districts have great recipes, employees, and services that lend themselves to creating effective marketing materials during special occasions. Special occasions are also a great time to introduce new recipes, line changes, or any new processes that may be unfamiliar. Let’s spice up your cafeterias with some fun activities for students, staff, and employees!